I’ve tried a number of different scope setups on my 7.62x39 Colt Sporter Lightweight over the years. The earliest was a compact Colt 4x32 with an integral mount that allowed it to mount to the fixed carry handle. I grew unhappy with the fixed 4x magnification so I found a short Picatinny-style rail that attached to the carry handle. To this, I attached rings and a Weaver 2-7x32 scope. I liked this setup a lot. The Weaver lived happily atop my AR for many years – until I got a new rifle for which that Weaver was a perfect natural match. The Weaver was stolen off the AR and put on the Remington M600. There were a couple of problems with the Weaver on the AR anyway. With rail and rings on top of the carry handle, the scope rode pretty high. And even though the 2-7 was a pretty short and compact scope, it was still a conventional style scope which left a lot scope hanging out there in mid-air in front of the carry handle. Though nothing ever happened, I was always worried about knocking the front of the scope and bending the tube or something. For a while, I tried an inexpensive Chinese “FACOG” as my sons call it (fake ACOG). That one also rode way too high on top of the carry handle. Then I tried a non-magnifying red dot. The problem I had with that was that in bright sunlight, it was just about impossible to see the dot. Plus, I wanted at least some magnification. The fact that my AR is not a flat-top, but a fixed carry handle AR, puts certain limitations on an optimum scope. Mainly, I want a short optic that doesn’t overhang the end of the handle, and I want it to mount as low and tight to the carry handle as possible. 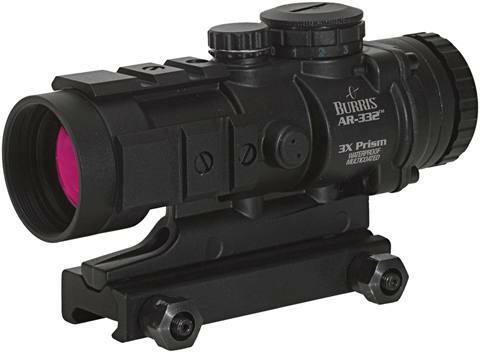 The Burris AR-332 comes close to being that optimum optic. It’s interesting that Burris does not refer to the AR-332 as a scope. It can be found in the “Sights” section of their website, not in the “Scopes” section, even though it has 3-power magnification. Way back when, I got rid of the Colt scope because it was only 4-power, but now I find myself going full-circle, back to a 3-power scope. The old Colt scope and the AR-332 are very similar in their overall length and mounting style. The AR-332 comes with a removable Picatinny rail mount, so it can be used either on a flat-top or carry-handle AR. Remove the rail mount and it nestles perfectly in the channel of the AR carry handle. A beefy thumb screw is included that goes through the hole in the carry handle into the bottom of the carry handle mount on the scope. Also included with the scope is a 2½” aluminum sunshade tube that screws onto the front of the scope. While that’s a cool added feature, most of the time I do not use it because I prefer the more compact configuration. Also in the box is a pair of flip-up Butler Creek style scope covers. Very nice. As you can see from the photo, the AR-332 also sports three short sections of Picatinny rail for additional accessory mounting points. I have no use for them, but they certainly add to the “tactic-cool” look. But a major feature that sold me on this scope is the well thought-out illuminated reticle. Burris calls it their “Ballistic CQ” reticle. If you think about that term, you might think that it’s oxymoronic. “CQ” stands for Close Quarters, where ballistic drop has no relevance. The Ballistic CQ is an etched reticle consisting of a circle surrounding some dots and lines. For close, quick sighting, you ignore the dots and lines and just use the large 9 milliradian circle to paint your target and press the trigger. 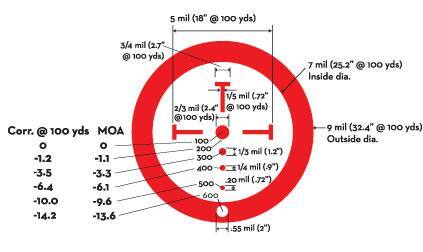 For normal longer range, 100 yards or so, you bear down on the center dot which covers 2.4” at 100 yards. After mounting up the scope and getting a good 100 yard sight-in, I proved the effectiveness of the Ballistic CQ reticle to myself at the club’s Patrol Rifle match this past April. The close-in shots were lightning fast, and making the longer shots took only slightly longer to steady the small center dot on the distant steel plates. There’s one thing you need to think about on the really close shots: A carry-handle AR puts the sight-line about 3½ inches higher than the centerline of the bore. Bill W. set up some super-close silhouettes that we had to make head-shots on. The A-zone for these head shots is not big. If you center the circle on the A-zone at close range, your holes will be low and probably out of the zone. I used the bottom of the large circle as the aiming reference to put my holes into the A-zone on this close range target. I ended up winning the match, the only shooter to come in under 100 seconds total for the five stages. Actually, what triggered me to make the purchase was the spring javelina season in February. I did take it out on the hunt, but the javelina just did not show themselves to me this year. 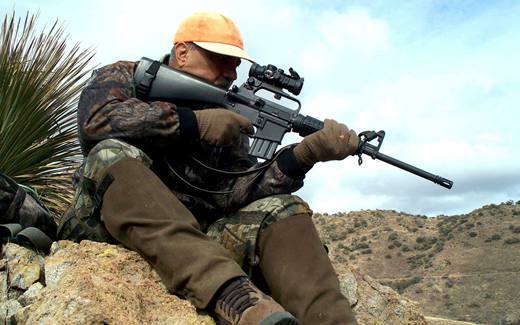 With handloaded Sierra softpoints, this rifle and scope combo is just about ideal for javelina. They are usually taken under 100 yards, but sometimes much closer. Javelina are dark colored animals. Sometimes it can be difficult to see a black reticle against a dark target. But switch on the illumination, and the reticle becomes crystal clear against a dark backdrop. The scope features both red and green illumination, in 5 intensity levels for each color. The switch is very positive acting from click to click. That “FACOG” I mentioned also had red and green illumination, but the settings were not all that reliable. As you switch from one level to another, the illumination may blink out entirely, or you may have to jiggle it a little to get the illumination to lock in at the correct intensity level. I was very pleased to find none of that with the AR-332. When the illumination is switched off, you do get just a plain black reticle, the reticle does not disappear entirely. So if the batteries die on you, you are not dead in the water. 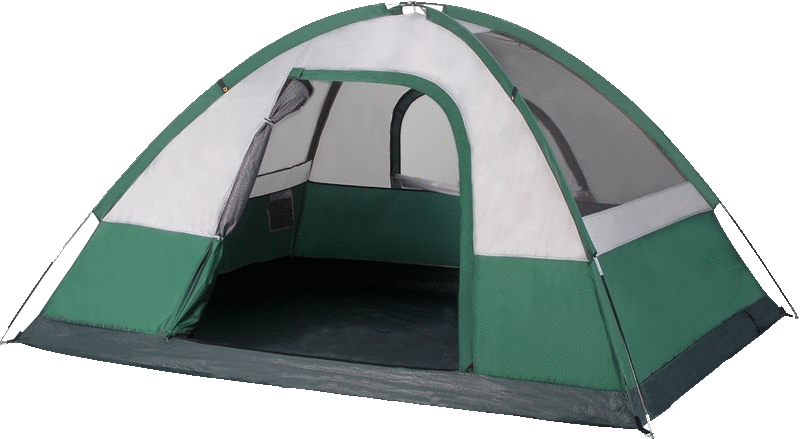 The illumination uses a common CR2032 button type battery. The manual claims 200 hours of battery life at the highest illumination level, around 500 hours at medium levels. Even in full, bright Arizona sunlight, I never had a problem finding a bright enough illumination level. But this brings me to the one major weakness of the scope: light transmission. Even though the scope has a 32mm objective lens, the image transmitted through the tube is on the dark side. It’s like wearing sunglasses while looking through the scope. I don’t know if the light is lost bouncing around in the internal prism, or if its due to the etched reticle plane, but if you are used to a normal tube scope, the brightness of the image is disappointing. The drop dots are tiny and very difficult to see. With only 3-power, targets at extended ranges are tiny and very difficult to see. I think I once did hit the 230 yard plate, and I harrassed the other plates pretty good at the longer ranges without hitting them. The calculated drops were very close, but it’s probably not realistic to expect sniper level hit probability beyond 150 yards with this scope and rifle. More work might help, but that’s not what this rig is for. Except for the dim image, I’m very happy with the AR-332 and expect that it will live a long and useful life on my rifle. The AR-332 currently retails for about $320.